33 mm 18K pink gold case, 7 mm thick, diamond-set bezel, blue dial with Grande Tapisserie pattern, pink gold applied hour-markers and Royal Oak hands with luminescent coating, Calibre 2713 movement with hours, minutes, date, 18K pink gold bracelet, AP folding buckle. 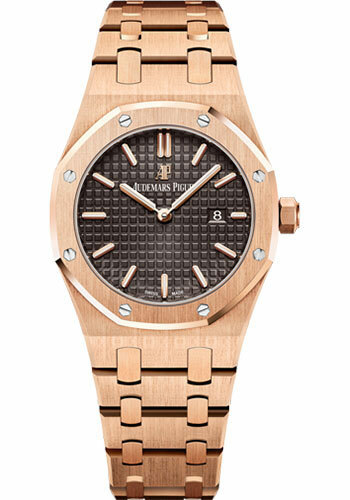 Water resistant to 50 m.
33 mm hammered 18K pink gold case, 7 mm thick, silver-toned dial with Grande Tapisserie pattern, pink gold applied hour-markers and Royal Oak hands with luminescent coating, Calibre 2713 movement with hours, minutes, date, hammered 18K pink gold bracelet, AP folding buckle. Water resistant to 50 m.
33 mm hammered 18K pink gold case, 7 mm thick, pink gold-toned dial with Grande Tapisserie pattern, pink gold applied hour-markers and Royal Oak hands with luminescent coating, Calibre 2713 movement with hours, minutes, date, hammered 18K pink gold bracelet, AP folding buckle. Water resistant to 50 m.
33 mm diamond-set 18K pink gold case, 7 mm thick, glareproofed sapphire crystal, diamond-set 18K pink gold dial with pink gold Royal Oak hands with luminescent coating, Calibre 2713 quartz movement with hours, minutes, date, diamond-set 18K pink gold bracelet, AP folding buckle. Water resistant to 50 meters.